As it takes more than passion to turn an idea into sustainable change, we kicked the next day off the day with a talk from our very own Rowan Kunz on using the Lean Business Model Canvas to take your idea from its infancy to a sustainable business. With pens scribbling and post-its sticking all the teams began to really break down their idea and map it out on the Lean Business Model Canvas. This is much easier said than done and takes a lot of discussion and debating within your team. Each team had to identify and overcome unique problems relating to getting their idea to market. Mapping out your idea can only go on for so long. Soon you need to start turning your idea into something tangible, which in a hackathon, means prototyping! So back to the Skill Up room to hear from Yohan Dantan on different ways to prototype your idea. He touched on both ends of the prototyping spectrum so that teams of varying skill sets could produce some sort of representation of their product. Flying through the rest of the 12 hour day, teams raced against the clock to convert their humble ideas into websites, wireframes, videos and more. The results were awesome, some teams had full blown websites getting real traffic from twitter posts. Others had detailed product prototypes that gave a start to finish picture of how their product was going to feel. Sunday morning had arrived, and with it brought a scurry of teams putting the polishing touches on their presentations for the final pitches. Back in the Henley club was assembled a judging panel made up of education experts, teachers and students. This blend was specifically chosen to reflect the real world stakeholders that are part of our education system but often get left out of key decisions/innovations. The hour of pitches flew by with teams impressing the judges one by one. It was incredible to believe that less than 48 hours ago these teams were merely passionate individuals with an idea. However, now standing up in front of a packed room, fighting for the product their team had incubated over the weekend, many of these teams had become baby startups. Soon enough the judges emerged back and with them brought some incredible feedback for each of the teams about how they could further develop their idea and get it to market. With this feedback, also came the decision from the judges on which team had developed their innovative idea into the most market feasible solution. The team that took away the cash & resource prize was Connect.Ed, a community of teacher led Professional Development. Runners up, receiving credit at a brand new Melbourne co-working space was the Feminist Collective, a team of high school girls fighting back against sexism in schools & online. 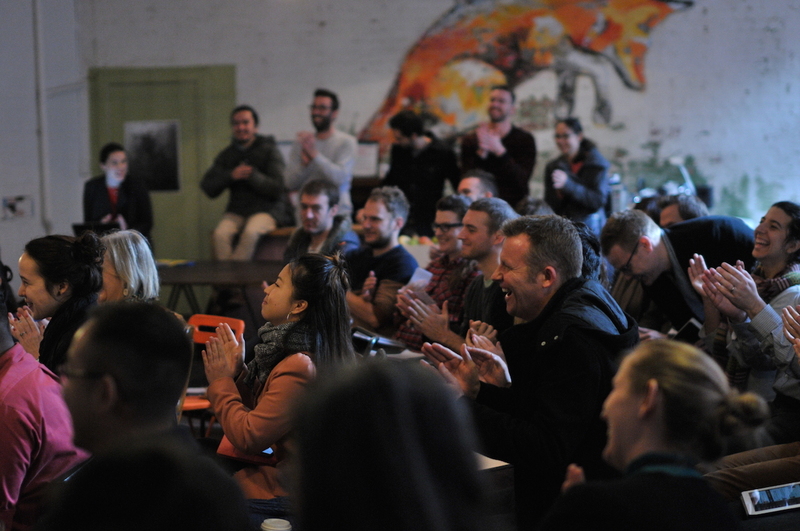 Prize winners or not, each team that came forward over the weekend brought incredible passion and motivation for igniting change in Australian education and transformed their humble idea into endless possibility.